DEC were a pioneer in business computing, bringing powerful computers to medium-size business with minicomputers such as the VAX series (launched in 1977), hooked up to a dumb terminal. In the twelve years since launch the VAX line had continued to grow and evolve with the times, but during the latter half of the 1980s it was becoming apparent that the underlying architecture was perhaps not what was needed for the 1990s. Computer manufacturers were beginning to produce machines with more streamlined processors – Reduced Instruction Set Computers (RISC). High-performance CPUs were also being seen in microcomputers such as the Acorn Archimedes, but in particular the Sun SPARC processor was powering a new generation of Unix workstations which were competing successfully against DEC’s own business. In January 1989, DEC announced the DECstation, their own take on a RISC-based Unix workstation. Unlike the DEC-designed VAX processor, the DECstation used a CPU bought in from MIPS. The original DECstation 3100 introduced in January 1989 was three times quicker than its VAX CISC-based counterpart, and given that DEC’s version of Unix (called Ultrix) was already a mature and widely-used product on VAXes it seemed that the DECstation had what it took to be successful. Specifically, DEC was aiming the DECstation at the low-cost server and workstation markets. Both of these device classes were offshoots of the minicomputer that DEC had helped to pioneer. Much more powerful than PCs of the time, the DECstation and its competitors introduced technologies that didn’t find themselves onto most people’s desks until a decade later. The DECstation could certainly have been a contender, but DEC itself was never really happy with a product that wasn’t 100% DEC all the way down, and after a couple of years of development DEC quietly abandoned the platform, instead switching to the DEC Alpha CPU in boxes such as the DEC 3000 AXP. 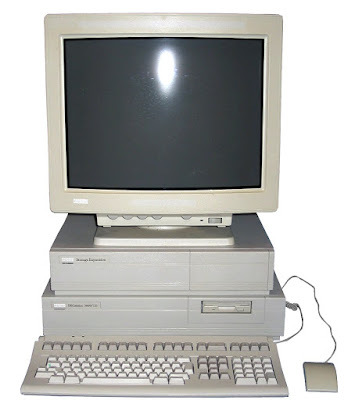 However, MIPS-based DECstations were still commonly in use and supported by DEC throughout the 1990s. They’re not the first thing you might think of as a collectable, but people do and a used base unit can cost around $500 or so if you are interesting in tinkering with redundant Unix hardware..